The man behind Street Fighter IV doubts that Capcom would want him to work on a Hyper Street Fighter IV after iterative Super Street Fighter IV hits stores this year. 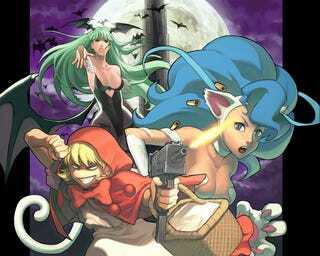 Instead Yoshinori Ono has something else in mind: Darkstalkers. Asked what his next dream project would be during an interview last week, Ono first joked that it would be taking his wife of ten years to Disneyland. There was, Ono told us, another fighting game series established shortly after he started at Capcom, a "little something called Darkstalkers you might know about." "If I was given the resources and the permission to do so, I would love to make a new Darkstalkers more than anything," Ono said. Because of the unique art style and transformations of characters the game would most likely need its own engine, but the art style, he said, would most likely mimic the visual style of Street Fighter IV. And any thoughts of Hyper Street Fighter IV were dashed by Ono when I asked if that were possibly his next title. "First of all I want to take a break for a little while," he said. "I've been doing these for awhile. After that I think that the atmosphere around the company is such that it might be time to take a chill pill on the upgrades for a little bit and try to branch out see what else I can do. "If we start doing a bunch of upgrades I'm just going to end up dying from lack of vacation so I hope they don't go that direction." Ono is just wrapping up his work as the producer of Super Street Fighter IV, due out on April 27 in North America for PS3 and Xbox 360. While the game has a number of interesting additions for the franchise, the one that most people seem to talk about most are the inclusion of Turkish oil wrestler Hakan and South Korean Taekwondo fighter Juri. Ono said that the impetus to create Hakan was his desire to include a "wacky" character in Super. "When we went to do Super we started to look into crazy fighting styles and we settled upon Turkish oil wrestling because it hadn't been done before, it's kind of unfamiliar to a lot of people and it's a good opportunities for humor," he said. " The creation of a Korean fighter was driven purely by fan feed back, including one very important fan, Ono said. "We got all the way to IV and there were still no Korean street fighter characters," he said. "I got a lot of flack from that, a lot of people complained about that so I wanted to pay them back, the Korean fans of Street Fighter. "In fact the president of Capcom Korea personally said, 'Hey, what are you guys doing? You have to put a Korean in there.' That's how Juri came about." Unlike Street Fighter IV, Super Street Fighter IV has no plans for an arcade release, Ono said. That's because Capcom doesn't feel the game, which seems to be most popular among western gamers, has enough support from arcades. It would need thousands of orders to make that happen. And if it did happen, Ono said, he'd like to think it would only require an upgrade rather than an entirely new motherboard. "If you know any arcade collectors or operators please tell them to write us letters saying they would buy 100 machines," Ono said with a smile.